One Piece begins with the execution of the Pirate King, Gol D. Roger. His death was intended to symbolize the power of the World Government, but had the opposite effect instead, conceiving the Golden Age of Pirates! One Piece is full of mythology. What happened in the Void Century, anyway? What about the meaning behind the Poneglyphs? Gol D. Roger plays a massive role in this same mythology and is regarded more as a deity than as the fallible man he actually was. His first mate (Silvers Rayleigh, in episode 400 of the anime) provides us with a differing account of the Pirate King, a perspective not as much concerned with the legend as the man himself. When Sanji asks Rayleigh what happened after they (Gol D. Roger’s crew) conquered the sea, his answer is blunt. They parted ways. The underlying sentiment here is that life goes on, and people come and go. This is said in the presence of the Straw Hats and it’s hard (and heart-breaking) to contemplate them ever separating, but it’s also affective in the way that it highlights fragility of the bonds that tie them (and, by extension, us to our friends) together, and how quickly those bonds can be severed. 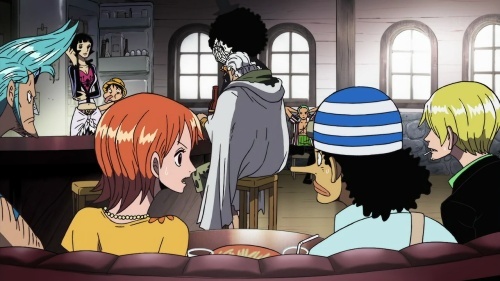 Usopp excitedly butts in and tries to ask Rayleigh about Gol D. Roger’s famous treasure (the One Piece,) but Luffy jumps in before Rayleigh can give his answer, screaming that if he’s ever told such a thing, the Straw Hats may as well just break-up there and then, because their enthusiasm for adventure would be lost if they knew exactly where to look. Usopp’s question might as well be “What is the meaning of life?” Just think, if some one provided you with an irrefutable, specific answer to that question, how would you feel? And how would you feel having finally fulfilled that meaning, too? From that point on, life would be pretty empty, surely? One wonders, how did Gol D. Roger feel at the end of his adventure? If Luffy ever finds that treasure, One Piece is finished. Quite frankly, I hope he’s searching forever. I really want to know more about the Poneglyphs but them’ve not been mentioned for ages, hopefully will find out more once they actually get to the New World. I’m hoping the One Piece isn’t actually treasure and is something else or one huge joke. And thanks for not spoiling anything, I daren’t even look at episode titles for fear of ruining a plot twist in the future, but it’s great to know there are still some big surprises in store for me. I’m still fascinated by Eiichiro Oda’s world and can’t wait to learn more about it. It might be metaphorical, but there’s plenty of clues that it’s also physical, though unlikely to be treasure in the traditional sense. Personally, I think it’s most likely to be the history of the Void Century or at least connected to the Ancient Kingdom. Also, while I used to expect finding it to mark the ending, now I’m not so sure. Luffy might find himself in the same position as Roger by the end, given that some of his techniques are whittling down his lifespan each time he uses them. So I suspect the key to the ending is going to be what Luffy decides to do with whatever he finds at Raftel and how that compares to what Roger did. Brack’s point about Luffy’s life-sapping skillset was certainly what sprung to mind when I was reading this scene. Still, it seems odd to imagine One Piece ending like that, and tempting to picture illness used as a point of suspense, with Luffy sneaking off on the quiet to carry on living, maybe like Simon from TTGL. On reflection, the prospect of the sad ending makes me think of the Drum Island arc – both that Dr Kureiha seemingly administered to Rogers before going on her way and the presentation of Hilruk’s last scene. Fatality or no, it seems the end will be about passing on a sense for romance. The partial way One Piece accepts noble deaths (i.e. only in the past tense) leaves things open, but I just can’t help but anticipate Oda’s choice of answer; endings make meanings. I have to agree here; I’m not a great fan of the big syndicated series that continue for years and years, but I think the central premise of One Piece – always searching for a treasure that is always a step out of reach – has really helped stave off a certain level of decay I think. Both Bleach and Naruto suffer a certain level of difficulty of having to always introduce new foes and new conflict, and seem to inevitably hemorrhage fans with every arc (a common question I’ve heard is “how many episodes did it take you to drop Bleach?). By contrast, the exploration theme in One Piece always provides a ready source of new adventure without forcing the issue of escalating the stakes (or, as a much earlier syndicated show put it so succinctly, bringing the power level over nine thousand). I often go back and re-watch the end of the Enies Lobby arc and try to analyze what it’s trying to say. After all, it’s pretty weird that the Straw Hats savior is their ship, Going Merry; in fact, it’s probably the most outlandish thing I’ve seen in One Piece, considering how out of the blue it is (Oda giving life to an inanimate object?!) The meaning I get from it is that Merry was a symbol of their adventures so far, it symbolizes everything they have seen together, and that’s what saves them in the end, their adventure, their friendship. So, Oda certainly isn’t adverse to a grand metaphor, and wouldn’t it be amazing if One Piece was actually building towards to an amazingly transcendental climax, that, whether it ends well for Luffy or not, actually has a deeper meaning, in fact, if Luffy’s fate ultimately does mirror that of the Pirate King, this should go down as a stone-cold masterpiece. That prospect is tantalizing (even though it’s probably many years away yet,) and the possibilities endlessly fascinating. with someone like Roger, i doubt they had such thing. Roger and crew are famous for conquering the oceans so everybody assumes that “one piece” probably are real gold and stuff. but ya i agree with many that “one piece” probably just meant the adventure of your life or something along this line.